Located in the old area of Lhasa City, Tibet, Barkhor Street is a very ancient round street surrounding the Jokhang Temple and the locals are always proud of it. As a symbol of Lhasa, it is also a must-see place for visitors. It's said that in 647, the first Tibetan King Songtsen Gampo (617 - 650) built the Jokhang Temple. Due to its magnificence, it quickly attracted thousands of Buddhist pilgrims. As a result, a trodden path appeared. That is the origin of Barkhor Street. Today even still many pilgrims hold the prayer wheels to walk clockwise there from dawn to dark. Also you can see some pilgrims walking or progressing body-lengths by body-lengths along Barkhor Street. Even some of them are teenagers or have experienced thousands of miles' walk to reach this sacred place. The way they express their piety could make you understand the holiness of religion. 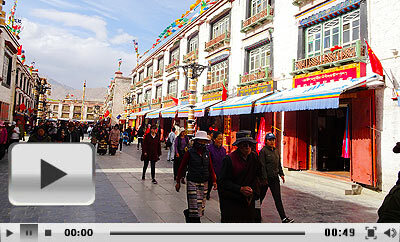 For visitors, Barkhor Street is a magical place showing the original outlook of Lhasa. It was paved by hand-polished stone boards. Though it is not broad, it accommodates thousands of tourists every day. Varied shops stand on its both sides and thousands of floating stands are on every corner. Most of them offer the prayer wheels, long-sleeve 'chuba' (the Tibetan people's traditional clothes), Tibetan knives and some religious articles for sale. Furthermore, some shops sell 'Thangka' (the Tibetan scroll painting), which is a unique art of Tibet with the themes of religion, history, literature, science and customs. Surprisingly, there are some articles from India and Nepal in this street as well. To sum up, Barkhor Street is a place full of religious atmosphere and a world of exotic articles. If you have been attracted by it, you should go there. Believe your eyes, and you will get a lot of surprise there. 1. You should walk in a clockwise direction along the Barkhor Street. 2. It is better not stay too late there. Because there are many lanes there, it's easy to lose your way in the evening. 3. Different vendors may sell the same thing at different price. So you'd better ask several vendors and get more information of the articles. Of course, you should also know how to bargain with them. 1. Take bus 3, 4, 5, 9, 10, 11, 12, 15, 17, 18, 19 or 24 to Lugu station and then walk north for 3 minutes to the street. 2. Take bus 7, 8, 20, 22, 23, 25, 28 or 29 to Cuomeilin and walk north for 3 minutes to Barkhor Street.